Every component/directive in Angular has a lifecycle; it goes through a number of different phases from its creation, to updating, to destroy. We can hook into those different phases to get some pretty fine-grained control of our application. To do this, we add some specific methods to our component class that get called during each of these lifecycle phases. We call those methods hooks. These hooks are executed in the following sequence. 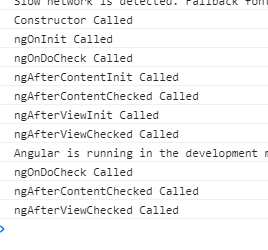 After creating a component/directive by calling its constructor, Angular calls the lifecycle hooks in the following order at a specific time. I have appComponent and it has an array, say ‘hooksArray’. It contains one object which is added to the constructor. Now, we are going to loop on hooksArray and add child component (say LifeCycleHookComponent component) into it. 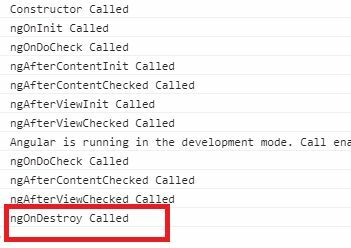 AppComponent has a destroy button, on the click of which we are removing components from the hookArray. Hence, the child component (i.e. LifeCycleHookComponent) is going to be unloaded from app component. Here is the code for AppComponent.ts. Given below is the list of different life cycle hooks in Chrome console log. Now, click on the Destroy button. The child is destroyed as shown below. OnDestroy is captured after clicking OnDestroy button.